But what if you’re not sure you’re up for earning a four-year bachelor’s degree? In fact, there are many careers that require two-year associate’s degrees and offer opportunities to earn good wages. Check out this list of five to get started exploring, and then learn more at Highest-Paying Careers. Radiation therapists have a median salary of $80,000 and the field is expected to produce better than average job opportunities in the next ten years. These health care professionals provide radiation therapy to patients, as prescribed by a radiologist. They might also review prescriptions and diagnoses; act as liaisons with physicians and supportive care personnel; and monitor radiation equipment. A two-year degree in radiation oncology technology is typically required; you can search here for radiation oncology therapy programs near you. With a median salary of nearly $73,000 a year and a robust job outlook (the field is expected to grow by nearly 20 percent between 2014 and 2024), dental hygiene is a great career opportunity. Dental hygienists usually work alongside dentists in dental clinics. They clean patients’ teeth and examine them for signs of oral disease. They might also educate patients on oral hygiene, take and develop xrays, or apply fluoride or sealants. 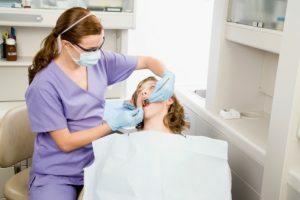 Dental hygienists typically need a two-year associate’s degree in dental hygiene, and you can search here for dental hygiene programs in your local area. Diagnostic medical sonographers earn a median wage of nearly $70,000 a year. These medical professionals use diagnostic imaging equipment to make ultrasonic images of patients, to help diagnose medical conditions and diseases. Work includes monitoring both patients and the equipment for the best outcomes, and, often, interpreting results of tests. With job opportunities projected to be above average, this field can be a great opportunity for someone who would enjoy working patients in a healthcare setting. The training, which leads to an ultrasound technician certificate, is usually two years, and you can search here for training programs in your area. Air traffic controllers earn a median wage of $122,000 a year—and you can enter this field with a two-year degree from an approved Collegiate Training Initiative school. Learn more about the requirements and the process from the Federal Aviation Association (FAA)—but beware, you have to be under the age of 30 to begin training as an air traffic controller. Although funeral service managers can often earn upward of $100,000 a year, there’s expected to be little to no job growth in this field over the next decade. That doesn’t mean that getting a job would be impossible, but interested candidates should research their local job market before training in a field with little growth. On the job, you’d plan, direct, or coordinate the services at a funeral home; you might have responsibilities like determining prices for services or merchandise and managing facilities or staff. Many people begin in this career with a two-year associates degree, and go on to earn a bachelor’s.